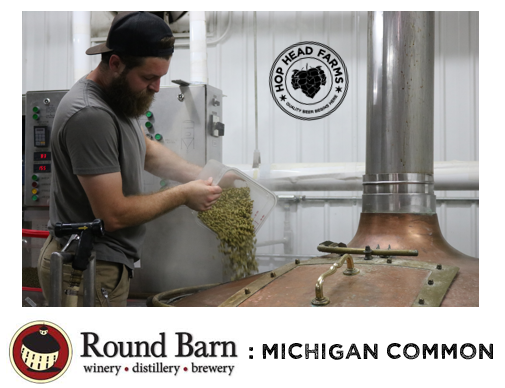 We are excited to have our homegrown Nugget and Crystal varieties featured in this local Michigan brewers take on the classic “Common” beer style. We cant wait to taste what the local terroir brings to this beer when it is released in early September. Here is Round Barn Brewer, Malkam Wyman talking about the style and what went into this beer. We have been excited about this beer since we put it on the calendar for 2018! There is some intriguing history with the California and Kentucky Common styles that were brewed in the mid 1800s until the prohibition era. They were usually locally sourced ingredients, and specifically lagers that could ferment at warmer temperatures without refrigeration. My approach to the Michigan Common is to create a beer derived entirely from local sources. As far as I know, there is no other Michigan Common in existence, so we’ll be pioneering a new style! Malt – Pale Malt, Vienna, and Munich were all sourced from a small maltster, Empire Malting Co. out of Empire, MI. These grains were grown and malted just 2 miles north of Sleeping Bear Dunes, along the coast of Lake Michigan. Hops – These were sourced from Hop Head Farms in Baroda Michigan. The Nugget was grown on Hollywood and Hinchman farms, and the Crystal hops were grown at the Lemon Creek Hopyard. These hops truly represent the terroir of Baroda, and traveled less than 4 miles to our facility. Yeast – California Ale yeast from Craft Cultures yeast lab in the Upper Peninsula. Water – Local Baroda township water.